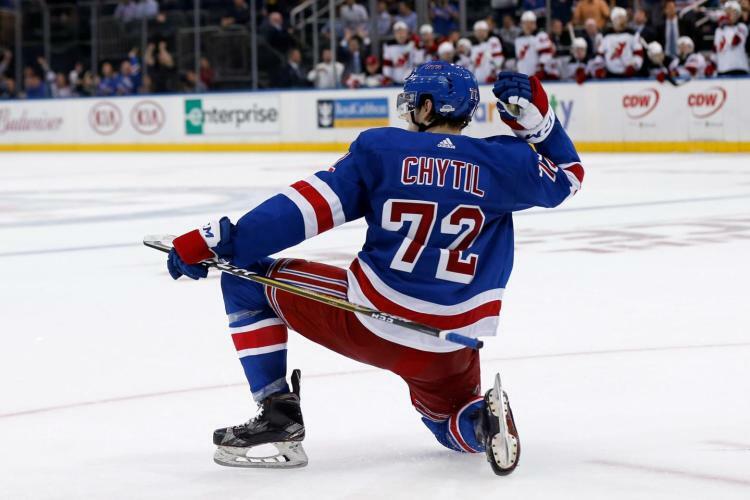 ← HARD HITS: Hayes is the best center on the Rangers, Pay him! So much for logic and suggestion. Less than 24 hours after I advocated committing long-term to Kevin Hayes, the Rangers decided the best option was to re-sign him for one year at over $5 million. Credit goes to TSN insider Elliotte Friedman, who broke the story just now on Twitter. Entering his fifth NHL season, the 26-year old Hayes is coming off a good year in which he established career highs in goals (25), power play goals (6), shorthanded goals (2), shots-on-goal (172), face-offs won (562), face-off percentage (50.5), and average ice-time (17:21). His 34 even strength points (17-17-34) ranked second behind leading scorer Mats Zuccarello (15-31-36). Nineteen of his career best 25 goals came either at even strength or shorthanded. Facing opponents’ top scoring lines, Hayes proved he was up to the challenge, producing well while deployed mostly in the defensive zone. In a miserable season for the team, he finished plus-one, taking on more responsibility with Derek Stepan gone. Only one other Blueshirt was a plus up front. That was Michael Grabner, who did most of his damage at even strength and shorthanded. He was eventually traded to the Devils for Russian D prospect Yegor Rykov and a 2018 second round pick. By giving Hayes a one-year deal, Rangers GM Jeff Gorton has set up the possibility that the valuable two-way center could be on the move. It all depends on how the development of youngsters Lias Andersson and Filip Chytil goes. Both are instrumental to the team’s future success. How much expectation should be put on both as they enter their first full year? That’s a question better asked for management. Being committed to a rebuild takes both time and patience. They must decide if Hayes will be worth keeping. By prolonging it for another year, the Rangers could be making the decision harder on themselves. I get why they were hesitant to commit to a long-term contract with Hayes. They don’t know where they’ll be next summer. A lot could change. They simply didn’t want to go six years at a potential average of $6 million per season. What if Hayes kills it under new coach David Quinn after showing improvement last season? His skating, puck possession and overall play should be a good fit. After totaling 44 points in a new match-up role, he is poised to set a new career high in points with 50-or-more a real possibility. If Hayes excels in Year 5, it will only make the Rangers’ decision that much harder. He could be worth more than his asking price prior to the one-year settlement. What if Hayes again proves he’s by far the team’s best five-on-five center? That all depends on Mika Zibanejad, who was below average last season despite his 27 goals with 14 coming on the power play. He finished minus-23. He must improve overall for any team success. With Hayes signed, only Ryan Spooner remains. Figure Gorton to reach a similar one-year settlement with the versatile playmaking forward, who can play on the wing. He was acquired from Boston in the Rick Nash deal that landed D prospect Ryan Lindgren and the Bruins’ first round pick. I don’t expect Matt Belesky to challenge for a roster spot. The Blueshirts boast much more center depth compared to past seasons. With Zibanejad and Hayes the top two centers, they have Andersson, Chytil, Boo Nieves and 20-year old prospect Brett Howden competing for the final two lines. It’s possible either Andersson or Chytil could shift to wing on a scoring line. Starting Andersson on the fourth line isn’t the way I’d go. Nieves can do that. Don’t forget both Namestnikov and Spooner can also slide into the middle if needed. The real question for the team is what about scoring wings. There’s playmaker Mats Zuccarello entering his final year, Chris Kreider the best finisher left, along with pass oriented Russian Pavel Buchnevich, and Jimmy Vesey, who must prove himself under a new bridge deal. The same for Namestnikov, who’s signed through 2020. Jesper Fast is a smart two-way forward you can plug anywhere. Scoring could still be a problem. The Rangers must do it by committee to make any headway in a strong division. Expectations are low. Maybe they can sneak up on people. This entry was posted in Battle News, NYRangers and tagged Boo Nieves, Brett Howden, Chris Kreider, David Quinn, Filip Chytil, Jeff Gorton, Jesper Fast, Jimmy Vesey, Kevin Hayes, Lias Andersson, Mats Zuccarello, Michael Grabner, Pavel Buchnevich, Rangers, Rick Nash, Ryan Spooner, Vladislav Namestnikov. Bookmark the permalink.